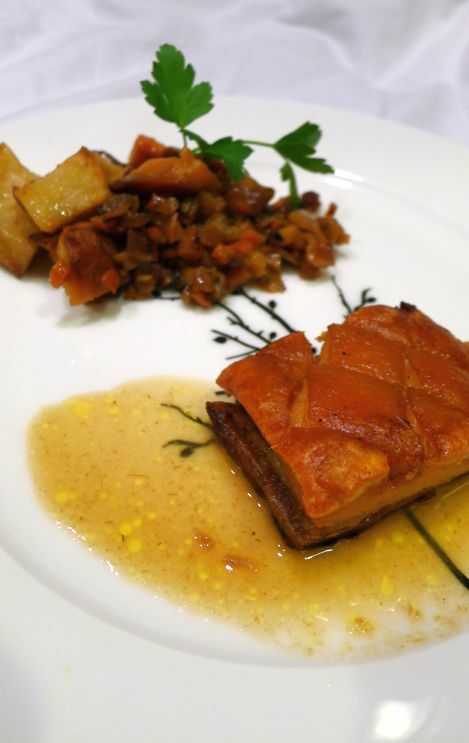 Pork belly is a very reasonable cut but it is so tasty! This recipe is very easy to make but plan ahead because you need to press the meat overnight or at least 4 to 5 hours before serving. 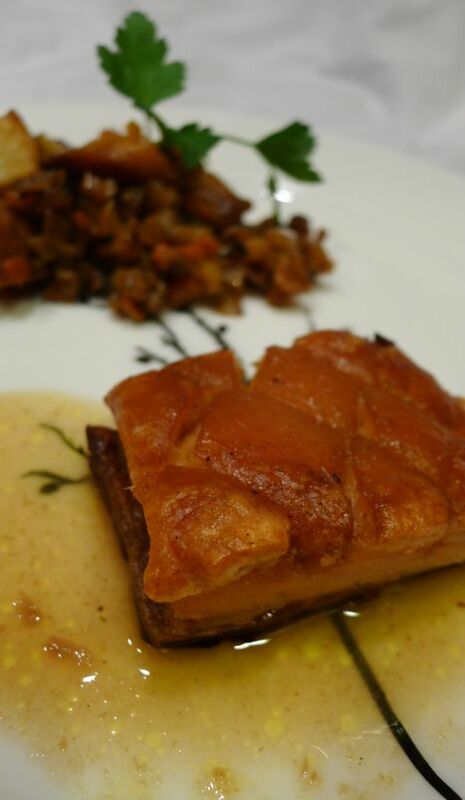 The pressed pork belly is then put in the oven at high temperature so the skin crisped up! 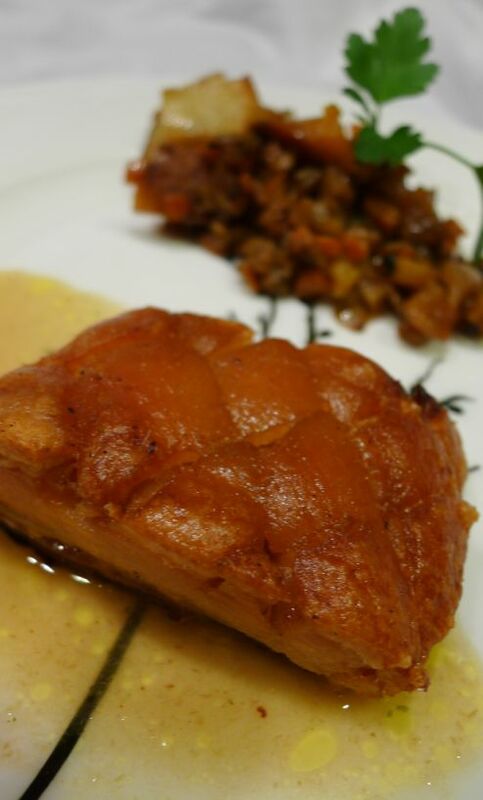 I have say that my guests really enjoyed the pressed pork belly! 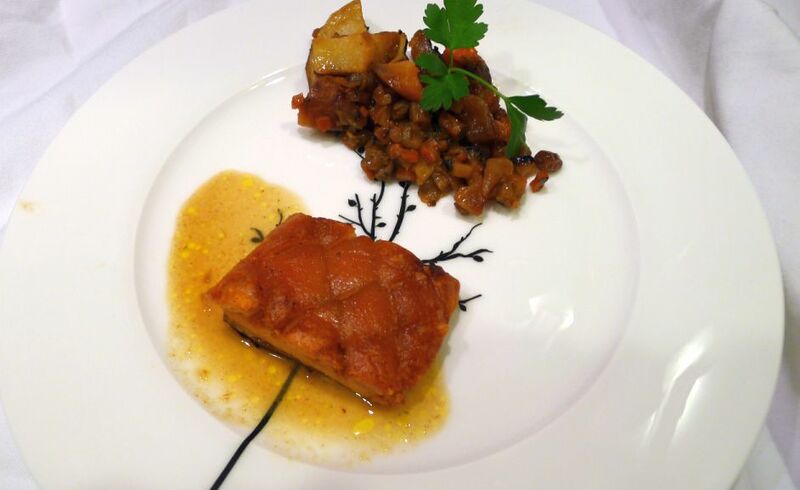 in a criss-cross pattern with a sharp knife. 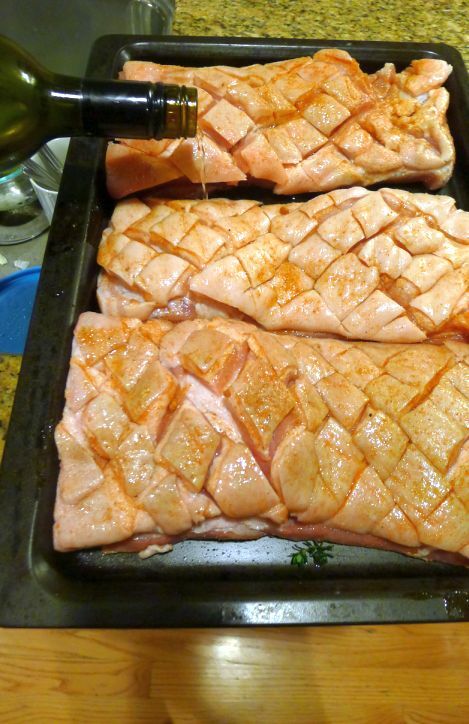 Rub all over with paprika, salt, and pepper and a drizzle of olive oil. 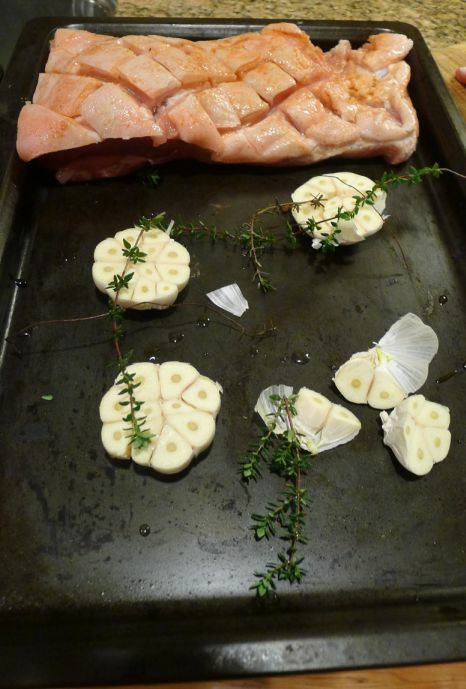 Place the garlic, halved side up, on a lightly oiled roasting tray and scatter over the thyme sprigs. 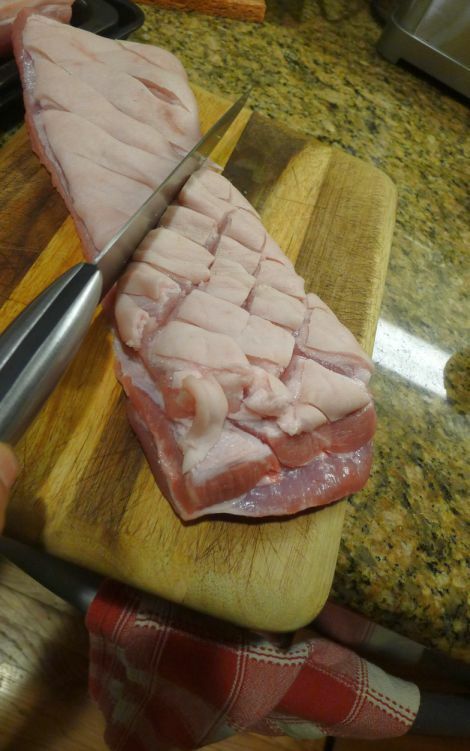 Lay the pork belly on top, fat side up. Trickle with a little more olive oil and sprinkle with a little more sea salt. Add a splash of white wine around the pork bellies. 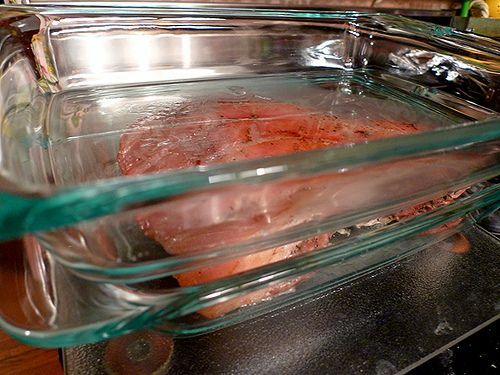 Cover the meat with a piece of foil and bake for 1½ hours. 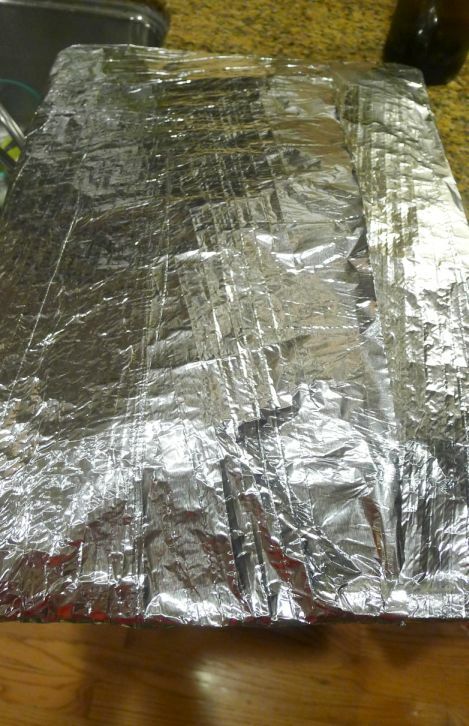 Remove the tray from the oven, peel off the foil and turn off the oven. 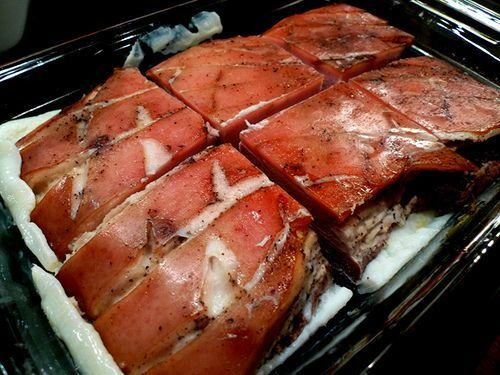 Baste the pork with the juices and return to the oven (off), uncovered, for another ½ to 1 hour until the meat is tender. 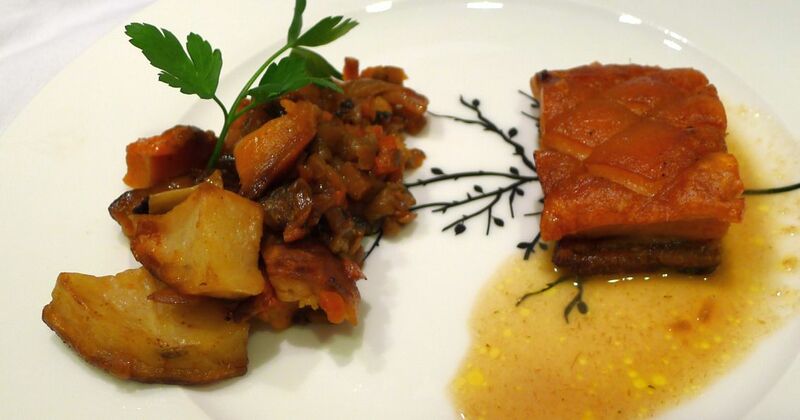 Continue to baste the pork occasionally with the pan juices. 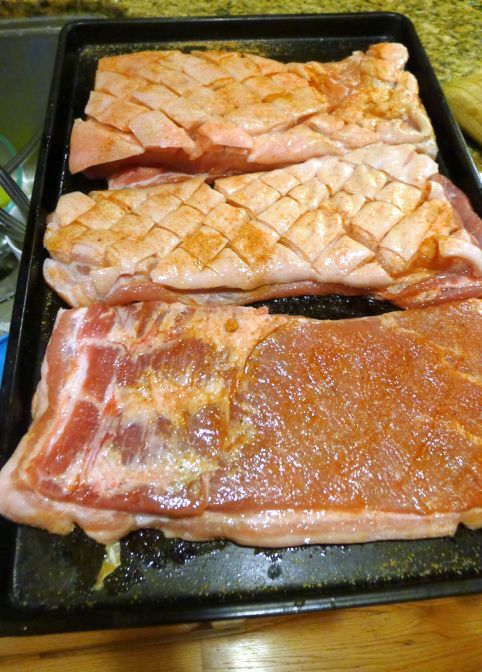 Transfer the pork to a clean chopping board and leave to cool slightly. 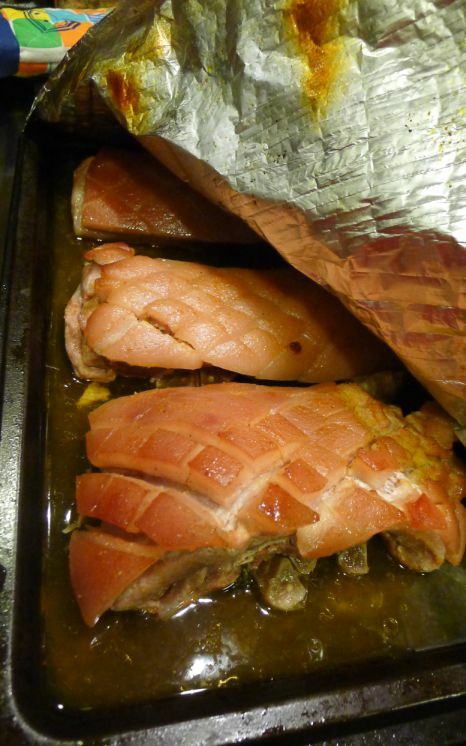 While still warm, place another tray on top of the pork and weigh down with a few heavy tins to flatten it. 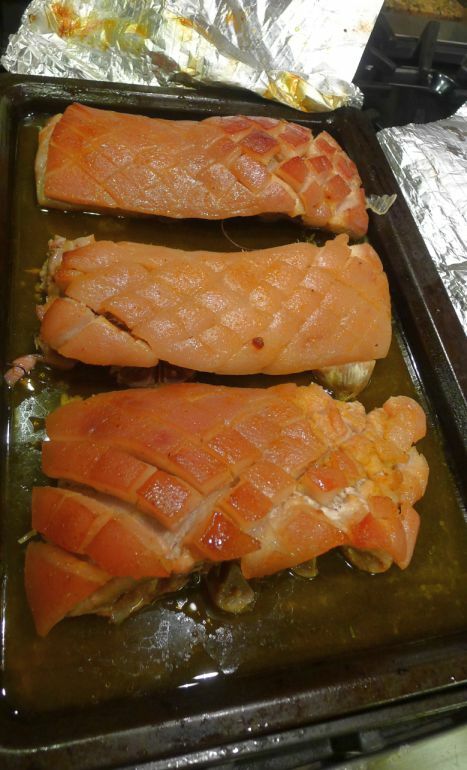 Cool completely, then chill for four hours or overnight in the refrigerator to set its shape. 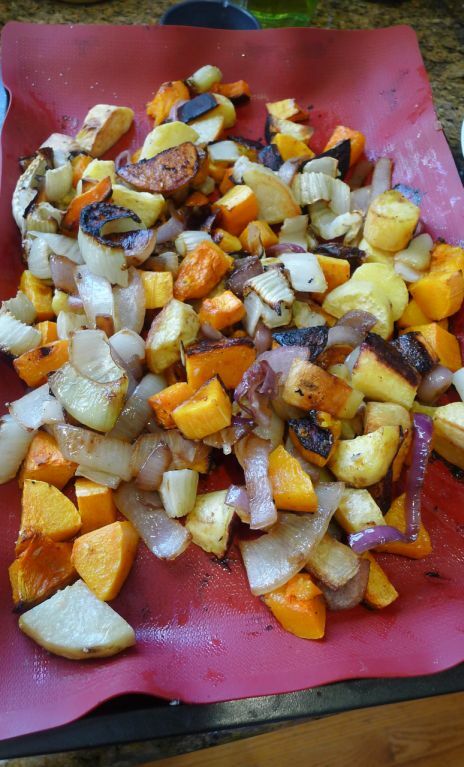 Pour off any excess oil from the roasting tray and place over high heat. 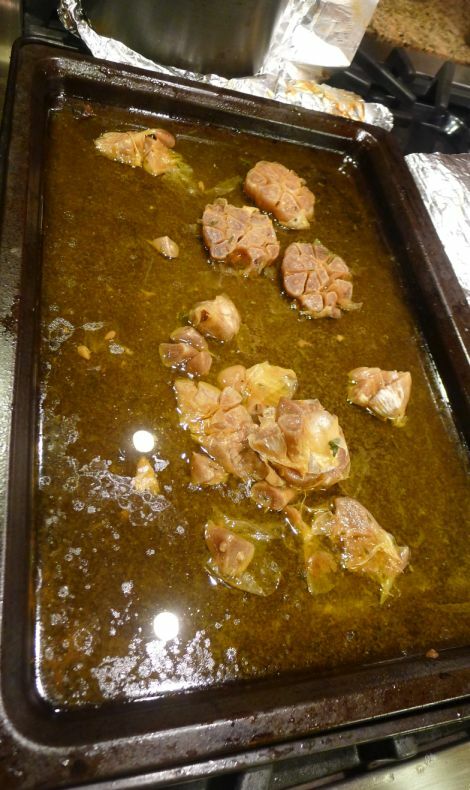 Deglaze the tray with a generous splash of white wine, scraping the bottom and crushing the heads of garlic with a wooden spoon to release the sediment. Boil the liquid until reduced by half, then add the chicken stock and bring back to the boil until reduced and thickened. 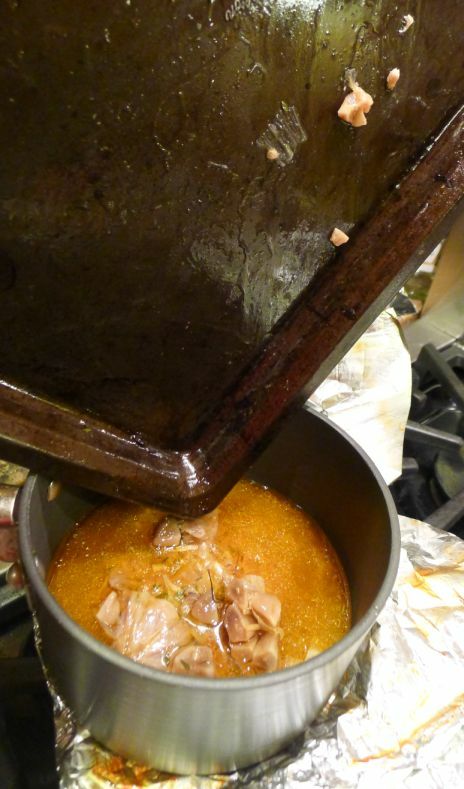 Strain the stock through a fine sieve, pressing down on the garlic pulp with the back of a ladle. Adjust the seasoning with salt and pepper. Cut the vegetables in cube. 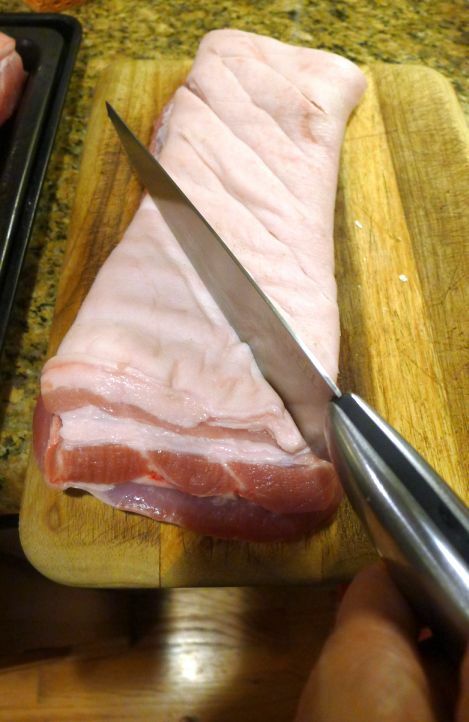 Don't cut too small because they will shrink during cooking. 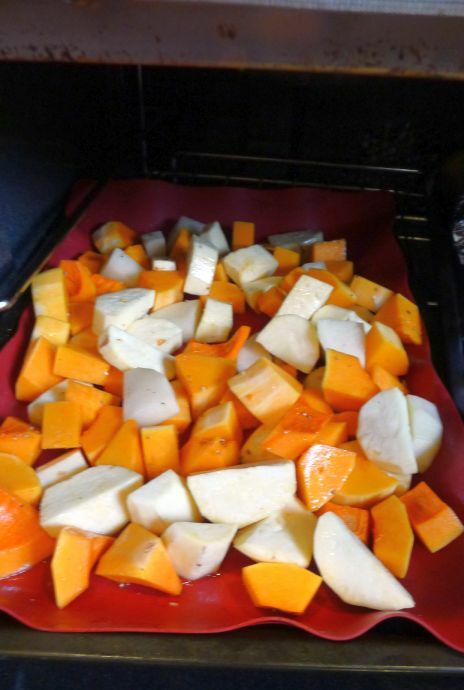 Preheat your oven to 325 degree F.
Roast the vegetables for about 30 to 40 minutes. Adjust seasoning once they are roasted. 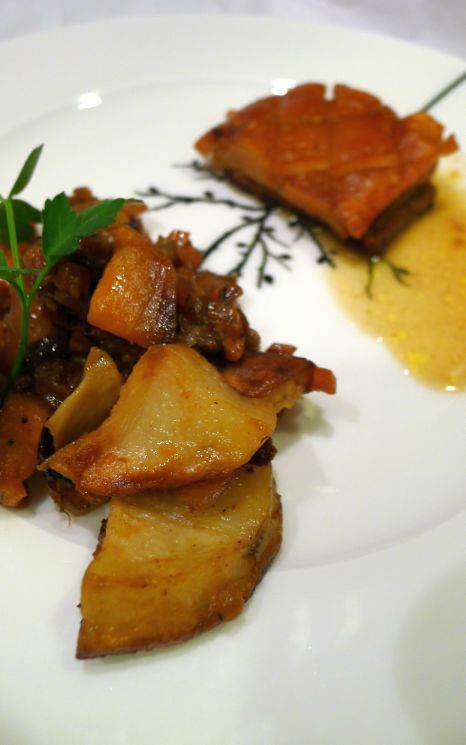 Cut the pressed pork into individual portions or squares and pat the skin dry with kitchen paper. 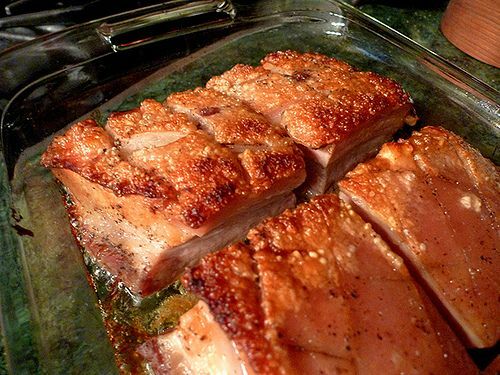 Place the pork squares, fat side up, in a roasting tin and drizzle with olive oil and a generous pinch of sea salt. Roast for 15-20 minutes until the skin is golden brown and crisp. 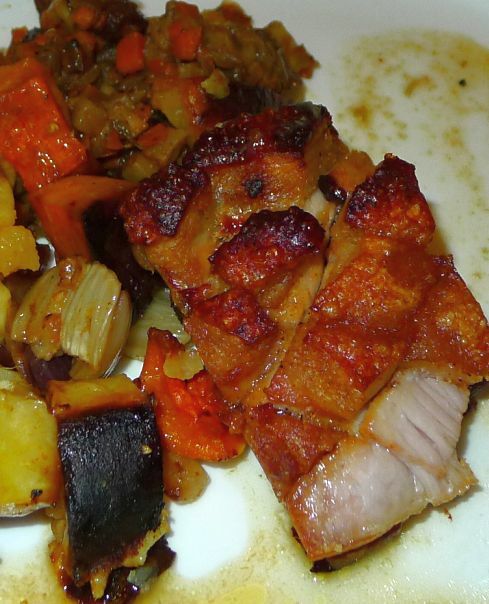 Rest the pork for 5 minutes, then serve with the light gravy and roasted vegetables..